Culture enthusiasts, spiritually-inclined travellers and history buffs will thoroughly relish the activities and experiences of these ‘must-see’ destinations of Indonesia. Along with Angkor Wat in Cambodia and Bagan in Myanmar, Borobudor ranks as one of the distinguished icons of Southeast Asia. This colossal Buddhist stupa and temple complex dates back to the 8th century. Located a 90-minute drive outside Yogyakarta, set against the dramatic backdrop of volcanic Mount Merapi and lush vegitation, these ancient monuments are a sight to behold. While being far from civilization, most who make the distant journey are not disappointed. Created by volcanic and river stone blocks, these monuments took nearly 100 years to complete, and to this day remain remarkably intact. 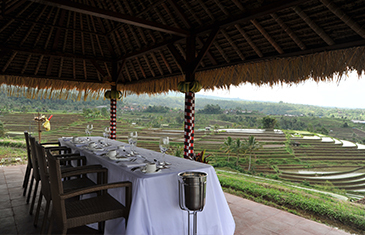 While visiting the grounds you can enjoy lunch at a local restaurant offering panoramic views of the temples. Upon your early morning transfer to the Yogyakarta train station, travel 6-hours east to the small city of Blitar. Other than being known as the resting place of the first president of Indonesia, Sukarno, Blitar is home to the Hotel Tugu Blitar. Located in an 1850’s colonial building formally owned by the Blitar family, the hotel is the oldest in Indonesia. Stately, white-washed pillars, crystal chandeleirs and furniture dating back to the 19th century. This hotel has been preserved in its old world charismatic splendor, while modernized just enough to accommodate the most discerning hotel connoisseur. The East Java countryside is awash in a million shades of green, and there is no better way to explore this gorgeous landscape than on a bicycle. 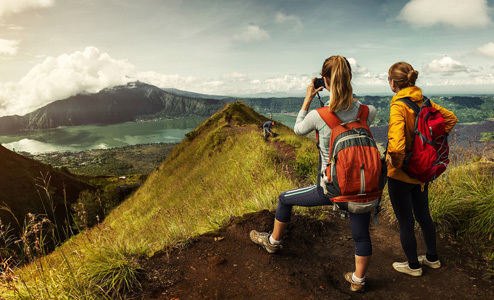 In Java, travelling off the beaten path promises natural beauty and unspoiled surprises. Begin your day with a bike ride through the quiet streets of Blitar and visit the final resting place of Indonesia’s first presidet, Sukarno. Then, cycle over to the handicraft center in Sentul Village, before heading to Candi Penataran – the largest and most beautiful Hindu complex in East Java. Laze away the afternoon with a picnic among the neon green paddy fields with Indonesian delicacies and a cup of Tugu Kawisari coffee. Take the morning to explore the delightful streets of Blitar on your own and in the afternoon, travel 2.5 hours northeast to the city of Malang. Upon arrival, you will be taken to Tugu Malang, a hotel and spa that fuses colonial architecture with local Indonesian heritage. Situated in the heart of the old town, encircled by tranquil lotus ponds, Tugu Malang houses a vast and priceless collection of antiques influenced by the Javanese Babah Perankan. The hotel has famously hosted every president of the country, world personalities and has constantly been listed as one of the most unique hotels in Indonesia. Tugu Malang is more than just a hotel, it is a touchstone for the beauty and richness of Javanese history. The 2,329-meter tall Mount Bromo is located at Bromo Tengger Semeru National Park. With its dramatic volcanic craters, breathtaking open plains and internationally famous sunrises, one cannot help but fall in love with the natural beauty this park has to offer. Spend the morning in the golden fields to see the sunrise and absorb the wealth of flora and fauna on display. On your way back to the hotel, visit the 30-meter high Coban Pelangi Waterfall, and the Jago Temple – two of the few unspoiled secrets in East Java. Be aware that to catch the sunset you must depart from the hotel at 1am. Conversely, if you wish to visit the park later, a 6a.m departure can be arrainged. Indonesia is a country brimming with temples, monuments and historical buildings. Begin today with a brief lecture at the private house of Bapak Anong Ishmail, the curator of the Sukarno Museum and leading expert on the recently World Heritage listed, Pakerisan River. Ishmail will lead the way in guiding you through “seven temples and meditation sites” rarely seen by tourists or local Baliniese. You will begin by visiting the first temple built in 8th century Bali after Besakhi, and then continue to a temple that blends Buddhist and Hindu wall paintings and statues. At this temple you will be greeted by a local preist who will conduct a blessing ceremony and wish you well in your future endeavors. Transfer to Bali airport for your onward flight.